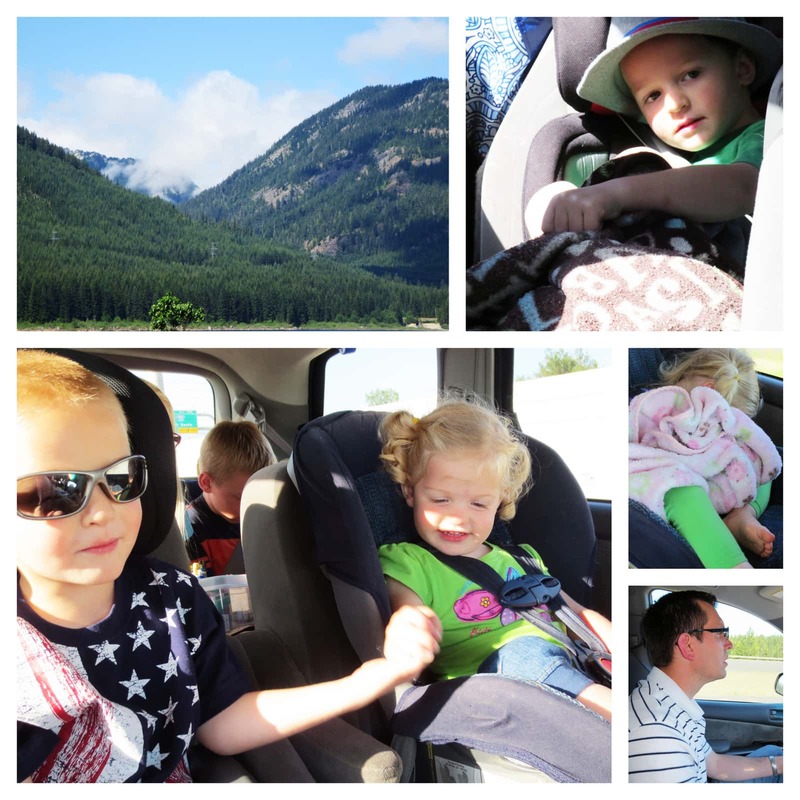 Day 9: The Trip that never Ends…it just goes on and on my friends. Lots of driving shoved into those last 2 days. Liza and Tru held hands. Cute kids. We tried to get wiggles out frequently with all our potty breaks. One stop we saw a Donkey and a llama at the gas station. 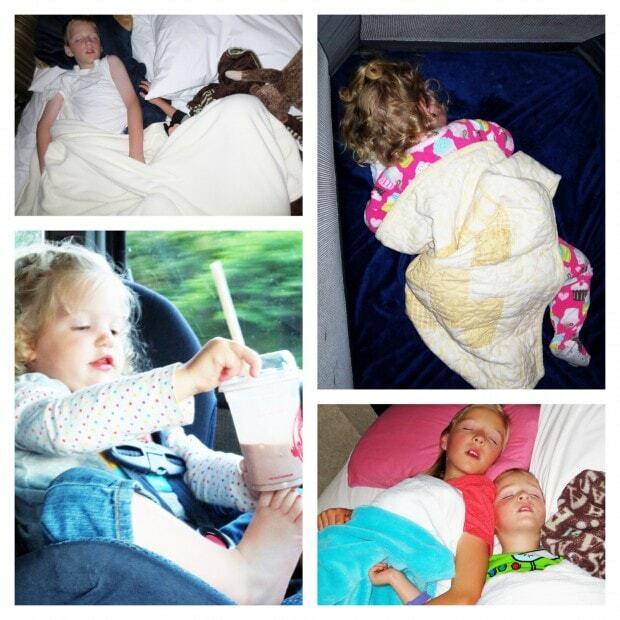 Liza slept in the car on our long days. Yay! We were sure glad to arrive home. I guess the trip did end! https://www.jimmyandheather.com/wp-content/uploads/2013/10/200-x-100-logo.jpg 0 0 Heather https://www.jimmyandheather.com/wp-content/uploads/2013/10/200-x-100-logo.jpg Heather2013-07-19 22:01:032013-07-21 08:21:57Day 9: The Trip that never Ends...it just goes on and on my friends. Friday, July 12, 2013. Day 9. Phew… we live! We still love each other! This temple was across the freeway from the hotel. It turned out to feel like a scorching hot morning with no shade on the temple grounds. 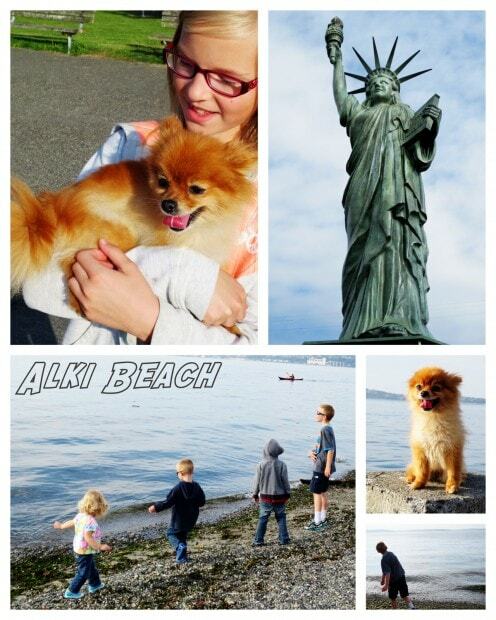 I think our bodies were in shock coming back from pleasant Seattle weather. This temple is a different style from what my kids are used to seeing. I’m glad we walked around. And of course, we were grateful for the church next door and the bathroom facilities. Wow – so many potty breaks for this family! Anyhoo…. 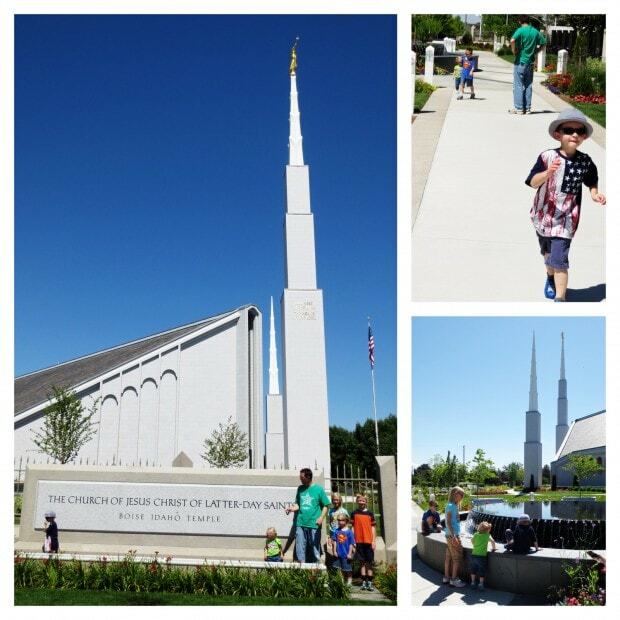 We love to see Temples! We weren’t going to head to Pike’s Market. I knew it was busy and the kid’s wouldn’t do well in crowds. But Jimmy ended up having a brief last-minute meeting one block from Pike’s Market. So we found a spot to park for $2 (miracle that worked out!). The kids and I walked around for 30 minutes. The flowers were gorgeous! The white nectarine sample was yummy. The kids were disgusted by the fish. The 3 pigs we saw were fun to climb on. Very interesting culture at this market. We found a bathroom (of course!) and then headed on our way to pick up Jimmy to start our long drive home. 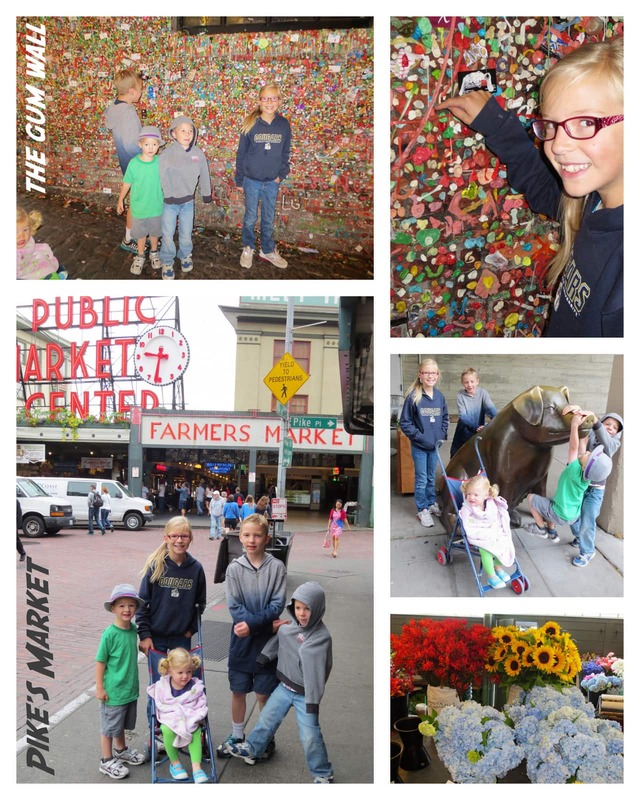 The Market Theater Gum Wall is a local landmark in downtown Seattle, in Post Alley under Pike Place Market. The Gum Wall is a brick alleyway wall now covered in used chewing gum. 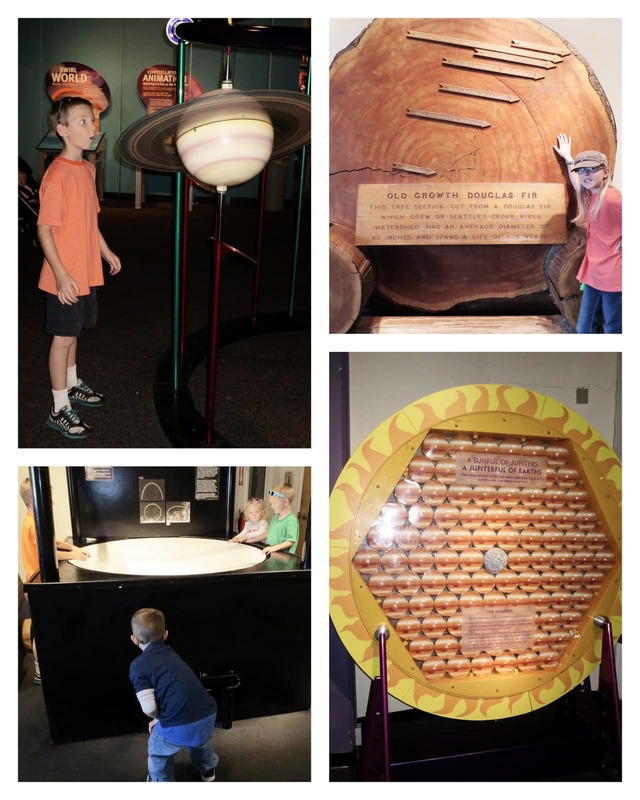 Parts of the wall are covered several inches thick, 15 feet high for 50 feet. The wall is by the box office for the Market Theater, and the tradition began around 1993 when patrons of Unexpected Productions’ Seattle Theatre-sports stuck gum to the wall and placed coins in the gum blobs. Theater workers scraped the gum away twice, but eventually gave up after market officials deemed the gum wall a tourist attraction around 1999. Some people create small works of art out of gum. It was named one of the top 5 germiest tourist attractions in 2009, second to the Blarney Stone. 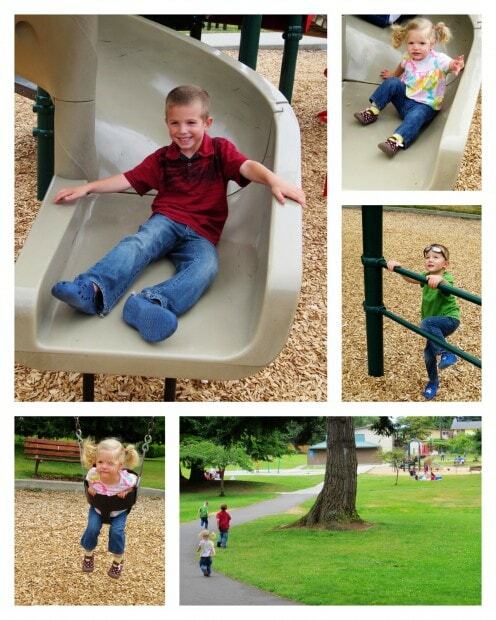 Oh what joy comes into a child’s face when they jump out of the van and run towards a playground! Max, Tru, and Liza were so excited. Liza was so brave to climb up to the top of the swirly slide and come down all by herself. She did it over and over. Truman did the monkey bars and asked me to hold him up. He was so strong and finished them all the way. Max, Hannah, and Abe ran around in the field and played tag?, maybe. It was perfect weather in Washington. The high was about 80 and sometimes the kids felt cool and wanted a sweatshirt (especially Max & Hannah). I loved the cool weather and wanted to buy a summer home here! It was funny to all be sleeping in the same space. This hotel in Lynnwood, WA had 2 double beds and a sofa bed. Hannah and Truman were bunk-mates. Hannah told Tru stories before bed… like Jack and the Beanstalk. It was sweet to watch them sleep. Abe & Max had the sofa bed. They were invading each other’s space a bit, but they survived. Max mostly sleeps curled up under the covers. I think he told me he started doing that at home because he was scared of monsters in the closet (hmmm… Monster’s INC.!). I slept pretty well when I took a 10 MG time-release Melatonin & a benadryl. Hotel sleeping is not my strength. But seriously – overall, the sleeping arrangements worked out much better than we anticipated. Liza got used to her pack-n-play by night 2 and then was just fine going straight to bed at the same time as the kids. Blessings! Oh – and the random photo in there is Liza after our dinner at Wendy’s. She was so funny putting her frosty on her toe. She didn’t drink much. Maybe her toe hurt!? But we needed to throw in a picture with a frosty because that was our favorite treat to get when it was hot on our drives to and from Seattle. We would get vanilla for Abe and Liza. And chocolate for the rest of us. Love Frosties! https://www.jimmyandheather.com/wp-content/uploads/2013/10/200-x-100-logo.jpg 0 0 Heather https://www.jimmyandheather.com/wp-content/uploads/2013/10/200-x-100-logo.jpg Heather2013-07-19 21:39:212013-07-19 21:40:43Day 6: We sleep! Outdoor activities seem to be the most successful type for our family. 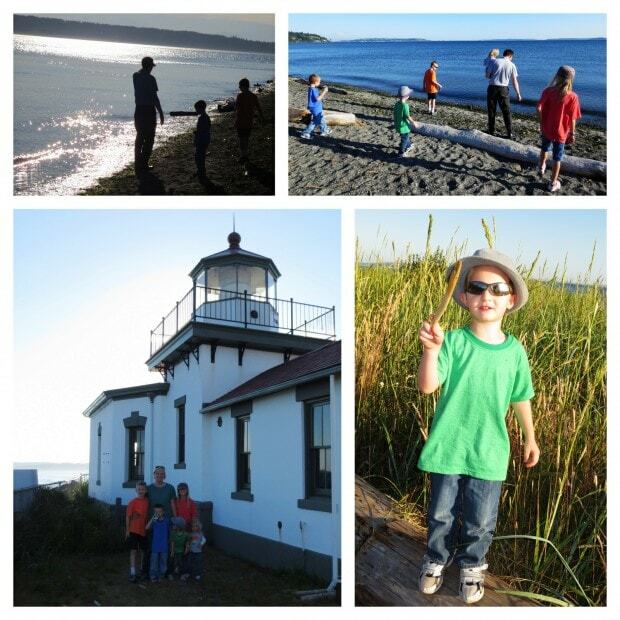 We headed to Discovery Park to take a look at the beach, the bay, and the lighthouse. Throwing rocks into water is always a huge hit with our kids. We could see Mt. Rainier in the distance. 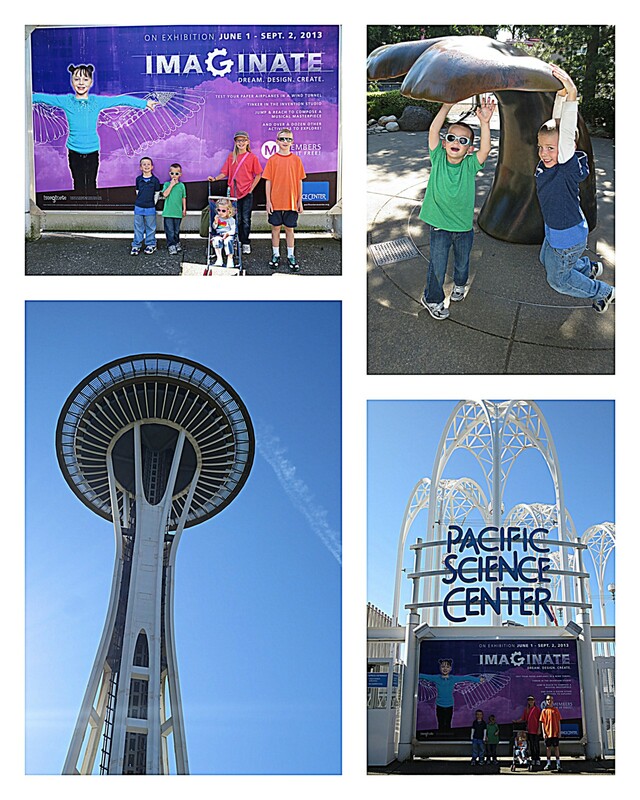 Max was really great at spotting ‘the volcano’ throughout our week in Seattle. The lighthouse was a little rundown and was locked so we couldn’t go inside. But it was fun to see. This beach had mostly sad with lots of driftwood and some rocks. Max wasn’t feeling well (tummy ache) so he was carrying around a Sprite to settle his guts. Tru loves sticks… and rocks. But on this trip he was all about finding the perfect stick. This stick ended up as a Bibbidi-Bobbidi-Boo Want (can you tell what movie Liza has been watching lately?!) Tru loves to be outside exploring. 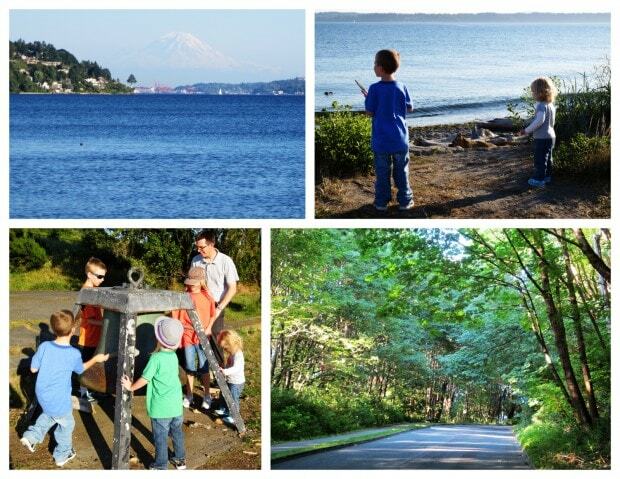 I’m really glad we went to Discovery Park this evening. It ended the day on the up side! Does this really deserve a post of it’s own? Probably not. There is traffic everywhere. But traffic in Seattle was more intense than SLC traffic (I guess that had something to do with me not knowing my way around). The good part about it was that we slowly creeped into Seattle at rush hour and Truman and Max fell asleep one or two days. We had either Bugs Bunny or Primary Songs playing. So I guess it turned out to be a mellow time when we all could have mental thought to ourselves. See – Traffic can be good! Max loves Root Beer. He is delighted whenever we get it. What a treat! We heard that there was a Root Beer Store near our hotel so we ventured out. We bought 6 different kinds of soda to share. 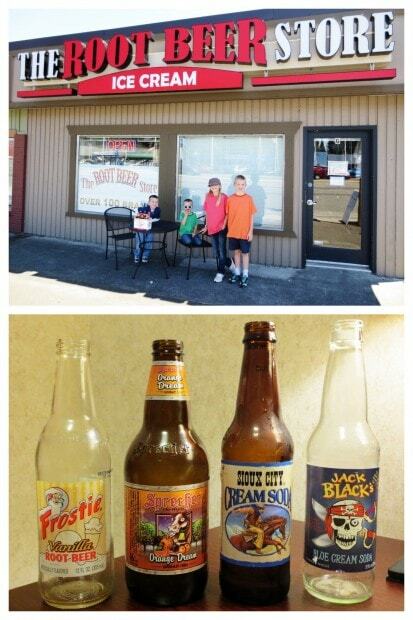 Our favorites were Frostie Vanilla Root Beer… Sprecher ORANGE DREAM… Sioux City Cream Soda, & Blue Cream Soda. They sold root beer taffy, root beer floats, and old fashioned candy sticks. It was not in the best part of town, but it was a good outing. I was about to call it quits before 10 a.m. and take us all back to the hotel to twiddle our thumbs for the day. I didn’t want to regret that decision… so we pressed forward. 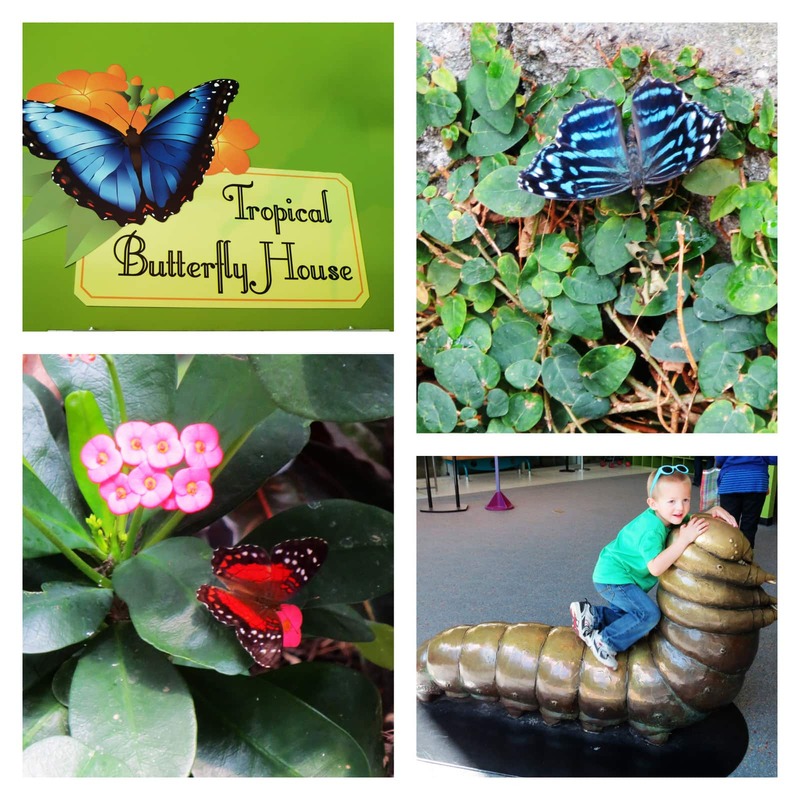 The Tropical Butterfly House was definitely a favorite for us all (well, except maybe Max… he was a little afraid – some of those butterflies were HUGE!). I loved the bright blue ones. There were plenty of red and pink ones. Really quiet and sweaty and hot (quite tropical!). But this was a neat adventure. 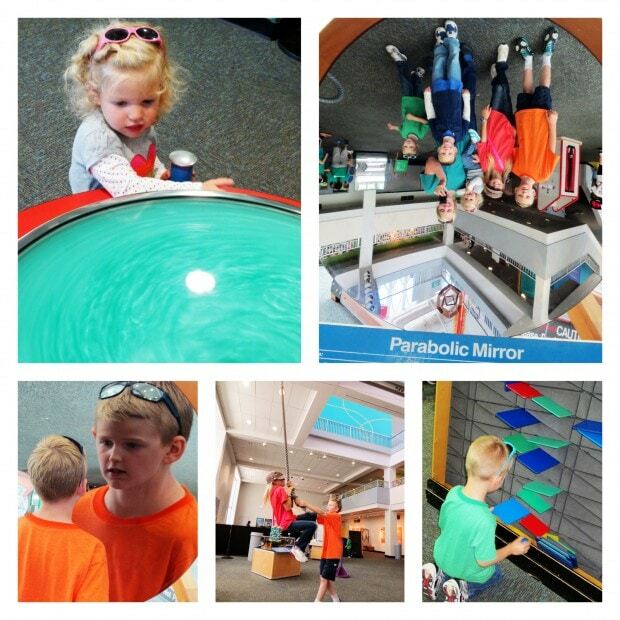 We liked the science playground. The mirrors made everyone smile. Tru loved his activity. Abe laughed at his image in the mirror. Hannah tried with all her might and weight to pull the weight down.